Electronics is the branch of physics (the science of matter and energy) that deals with the flow of electrons and other carriers of electric charge. This flow of electric charge is known as electric current, and a closed path through which current travels is called an electric circuit. The modern era of electronics originated in the early twentieth century with the invention of the electron tube. An electron tube is a device that stores electric charges and amplifies (intensifies or strengthens) electronic signals. In 1947 the industry took a giant leap forward when American physicists John Bardeen (1908–1991), Walter Brattain (1902–1987), and William Shockley (1910–1989) developed the smaller, more efficient transistor, which led to a new generation of miniature electronics. In the late 1950s, American physicist Robert Noyce (1927–1990) invented the silicon integrated circuit—an even more efficient way to process electronic impulses that has carried the electronics industry into the computer age. 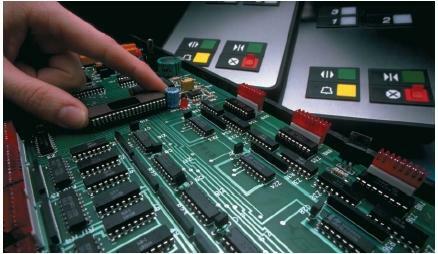 The 1980s saw the development of circuits employing very-largescale integration (VLSI). VLSI technology involves placement of 100,000 or more transistors on a single silicon chip. VLSI greatly expands the computational speed and ability of computers. Microcomputers, medical equipment, video cameras, and communication satellites are just a few examples of devices made possible by integrated circuits. Researchers believe that, in the future, new technologies may make it possible to fit one billion or more transistors on a single chip. Of the many forms of electronics, none has helped transform our lives more than digital electronics, which began in the 1970s. The personal computer is one of the best examples of this transformation because it has simplified tasks that were difficult or impossible for individuals to complete. Today electronics has a vast array of applications including television, computers, microwave ovens, radar, radio, sound recording and reproduction equipment, video technology, and X-ray tubes.